Range of use: canoeing, skis, surfing boards, tools, ladders, skateboards, etc. Usage: storage room, garage, shop, showroom, etc. The product has a wide range of uses. Don't put your kayak and ladder on the ground. Using this product, you can save more space for kayaking and other tools. 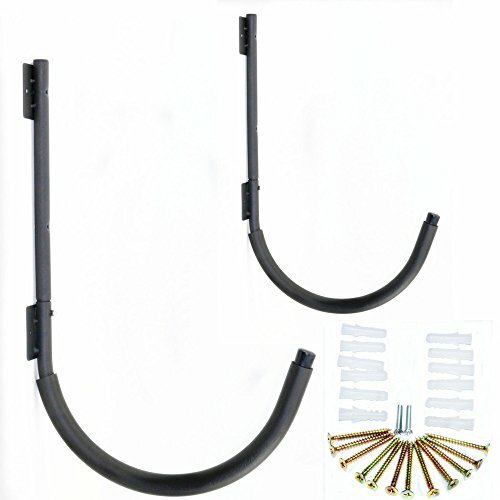 Simple installation, design 12 grains to prevent rust screws, screws and tighten the products only need to be connected easily lift your heavy kayak in the wall or column can be, do not even need to strap tight, you only need to hang on a kayak can go away. The design has a horizontal pin screw, aimed at the cave to tighten, penetrate, prevent slipping. Designed with PVC soft plastic, it won't hurt people or your belongings. Products by the vast number of users like, have it is a good choice. Carrying capacity: you can easily lift 100 pounds of kayaking, skis, surfing boards, or ladders. Material: using 1.5mm thickness of high precision cold-rolled steel pipe, the surface after 200 degrees of high temperature baking outdoor special paint, long-term corrosion resistance. The color is sandy black. Protection: use 7mm thick VEA cotton to wrap the steel, which gives you a better protection for the items you put. Installation: very simple installation, installation of a pair of only 30 minutes. Packaging: the original factory carton packaging, bubble bag protection products, the transportation process is not easy to damage the product spray paint.